The case is complex. Mr Assadi was based in Austria, arrested in Germany and will be extradited to Belgium. The German court ruled that his diplomatic immunity did not apply, since he was arrested while on holiday. "The wanted man cannot cite diplomatic immunity because he was on a several day holiday trip outside his host state Austria, and not travelling between his host country and the state that dispatched him," it said. Iran has denied the existence of any such plot, saying it was designed to mislead the public about who was responsible and harm Iran's international standing. France, Belgium, Austria, Luxembourg and Germany are all involved in the story of the alleged plot. On 30 June, Iranian opposition supporters had gathered in Paris for a rally of the National Council of Resistance of Iran (NCRI). That day, two Belgian nationals of Iranian origin - a husband and wife known as Amir A and Nasimeh N - were caught carrying half a kilogram (1.1lb) of explosives and a detonator. They were arrested in Belgium by police there - but that was not the end of the story. Another man, identified only as Merhad A, was arrested in Paris, the city where the alleged bombing was to have taken place. He is accused of being an accomplice. 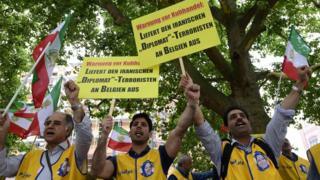 Assadollah Assadi, meanwhile, was an Iranian diplomat based in Austria - but he was arrested by police in Germany. Prosecutors in Germany say that Mr Assadi is an intelligence agent who met the husband and wife team in Luxembourg, where he ordered the attack and handed them the explosives. Austria quickly moved to strip him of his diplomatic status after his arrest by German police. Despite France being the intended target, the explosives were uncovered by Belgian police, and Belgium requested the extradition of the remaining suspects it did not have in custody. But the German court ruling means the question of diplomatic immunity is irrelevant - and Mr Assadi is now facing extradition to Belgium. The court has handed back the extradition to the German prosecutor to handle. Tehran, however, says the entire plot was concocted by the NCRI - considered to be the political arm of dissident group Mujahideen-e-Khalq (MEK), and designated as a terrorist organisation by Iran. "The latest scenario has been planned and carried out to damage Iran-Europe ties amid such sensitive and crucial times," foreign ministry spokesman Bahram Qassemi said when news of the arrests emerged.